Ed Byrne’s official website describes himself as “Your Outdoor Loving, Cat-Loving Stand Up Comedian’ which sounds on the face of it boring. 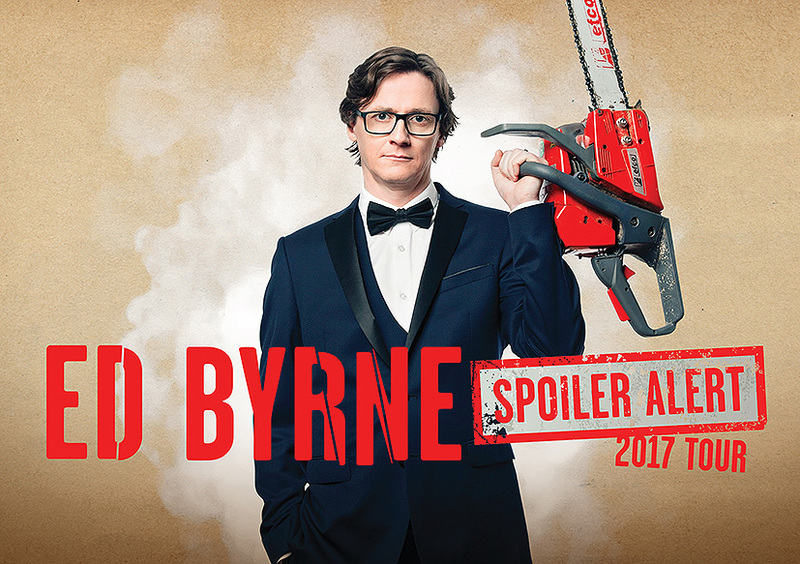 However, then you realise that his promotion imagery for the Spoiler Alert Tour features a very sharply dressed Byrne wielding an impressive chainsaw and suddenly the entire prospect gets a lot more appealing. Spoiler Alert promises to demonstrate why exactly the current generation is the most spoilt of the lot. Considering Byrne’s working-class Irish roots, you can immediately imagine how much hilarity will ensue with a promise of strong, if not slightly transgressive material. The show was originally penned as I’ll Millennial You In A Minute, but this title was considered too confusing for the demographic. Despite his low points of eight years of voice-over work for Carphone Warehouse, the comedians’ special edition of The Weakest Link and playing the title character for ITV’s production of Aladdin, Byrne has taken recent successes in his stride becoming a regular for BBC’s satirical panel show Mock The Week, and winning a record £117,000 on a celebrity edition of The Chase. Byrne is certainly a comedian on the rise, with his recent tours being greeted with much excitement and expectation, becoming a regular at the Edinburgh Festival Fringe, as well as massive success internationally and at home. Ed Byrne’s Spoiler Alert promises to consider the question of “Are we all just spoilt brats?”, spin it around, and leave everyone in fits of laughter in his latest show, and I for one can’t wait to see what he comes up with.